Weblog of Dashmesh Pictures [V.1.1]: Jeeta Jatt... The Movie!!! Looks like the brilliant minds behind "Where not to do Bhangra" have returned with the anticipated hit of "Jeeta Jatt!" This new short was screened at this year's Spinning Wheel Film Festival and won the crowd over immediately. I'm glad to see silly stuff like this happening... and only wished I could be on the West Coast to help these guys out. Enjoy the short below, which is divided into two parts. 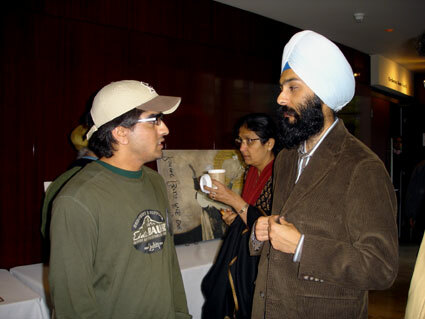 While chilling outside the SWFF 2006, Sartaj trying to act tough with Mr. Shane Gill... who played the infamous Jalia Dhindsa. Watch out Gabbar Singh, Jalia Dhindsa is coming for you!